Optimized cmu and grout minimize greenhouse gas impacts compared to other systems. Reduction of carbon emissions by buildings and their components drives many strategies in green rating systems. Concepts addressing regionality and transportation, sourcing of products and raw materials, and energy consumption have an underlying intent of reducing greenhouse gases. The celebrity target for reduction is Portland cement (Pc), widely known for the high amounts of carbon dioxide produced in its manufacture. CO2 is the primary greenhouse gas emitted through human activities1. The rule of thumb that equates a ton of Pc to a ton of CO2 pumped into the atmosphere is easy to comprehend and remember, making the material the lowest of hanging fruit. 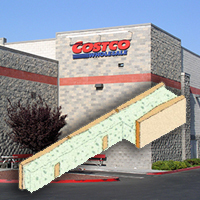 As undisputed a culprit as it may be, Pc produced by traditional methods is entrenched in the building structure supply chain. Concrete products utilizing Pc provide cost-effective, durable, and adaptable solutions for structures. The industry is working on many strategies to mitigate the impact of Pc production, including reduced energy requirements, alternate materials, and revised chemistry and production methods. Until next generation materials have matured to market, Pc as currently manufactured will dominate concrete products. The challenge at present is in optimizing and reducing Pc's role in a given product. Not all products manufactured with Pc are created equal. Angelus Block and Desert Block have long manufactured concrete masonry units (cmu) with attributes to meet stringent building codes where seismic capability is paramount. Unit strengths, weights, and configurations for reinforcement requirements are standard issue. Optimal mix designs are just as important. Resource utilization must be as finely tuned as the plants that produce the cmu. In particular, that means maximizing the effectiveness of Pc in concrete mixes while minimizing its use. It makes economic and environmental sense, of course, and the reduction of CO2 impact is real and measurable. Building systems incorporating Pc include tilt-up concrete walls and concrete masonry, two popular and competitive building envelopes of which some hard-held perceptions abound. While the merits of each in timeline, initial cost, and long term cost could be debated in its own article, studies show similarities in short term costs, and advantages to concrete masonry in schedule and long term upkeep. Here, though, we'll take a look at a very significant distinction between the two — Pc consumption. Where the carbon footprint is truly a concern of a project's stakeholders, the math says concrete masonry is the system of choice2. To demonstrate the benefits of concrete masonry specific to carbon, let's consider a structure with 100,000 square feet of wall area. This could be a large warehouse, industrial or office complex. We'll assume a 6-inch thick tilt-up wall, and an 8-inch thick concrete masonry wall (nominal dimensions). Of course, the tilt-up is all concrete; the concrete masonry wall consists of cmu and masonry grout. Tilt-up: concrete mix containing 7 sacks of cementitious materials, with 15% of the Pc replaced with fly ash. That equates to 524 tons of Pc. Concrete masonry: cmu manufactured by Angelus Block and Desert Block only require, on average, an equivalent of 2.5 sacks of Pc per cubic yard. However, at least half the wall is typically solid grouted. The masonry grout is a 7 sack mix, with 50% Pc replaced with fly ash3. Combined, that equates to 392 tons of Pc. Thus, the 8-inch concrete masonry consumes 132 tons less Pc than the 6-inch tilt-up wall. By some measures, that is 165 tons less carbon dioxide. On average, concrete masonry walls require 2.6 pounds less Pc for every square foot of wall area, even at the 8-inch cmu to 6-inch tilt-up comparison. That difference in CO2 is impressive, but not necessarily the end point. It illustrates the sophistication of a building system that can be overlooked as a holistic contributor. Concrete masonry is viewed differently from the perspective of each discipline – to engineers, a structural or utilitarian element; to energy consultants, a heavy mass wall; to architectural designers, a palette from which to create; to owners, a durable building. In fact, it is all of these. While the world of architectural products clamors to introduce the latest in green design and technology, giving specifiers a daunting task of filtering out hype from reality, we have been steadily refining a product with a long history. That longevity is not aged or outdated; it is tested, and offers a proven baseline on which to build. New products marketed for robust sustainability based on a particular feature may not meet all of the requirements for established standards and codes. Such features must be balanced with good old health, safety, and welfare, and assessed within the context of the product's holistic role in the structure. Before specifying products claiming sustainability stardom, project teams must fully vet the proposed material to be certain it meets all criteria — including code-incorporated ASTM standards — required of the products they intend to replace4. 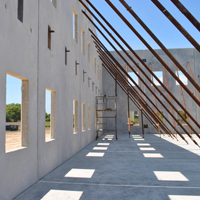 Green building rating system credits often focus on certain product classes and distinct criteria while overlooking the beneficial synergy of building systems such as concrete masonry. While a universal credit for that may not exist in all rating systems, concrete masonry's inherent qualities and functionality support and contribute many of the strategies that are key to sustainable design - energy efficiency from heavy mass walls, low extraction impacts, multiple functions in one element, recycled content, and regionality to list a few. Concrete masonry is more relevant to sustainable and resiliency goals today than ever, and uniquely offers benefits to multiple disciplines and strategies. It is truly holistic, in and of itself, and within the context of the project. It's optimized now, and is in a great future-forward position to continue to evolve.